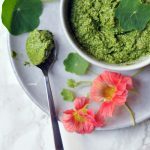 A beautifully green Anti-Inflammatory Nasturtium Pesto. A great way to use those peppery wonderful green leaves of the tropaeolum plant, commonly known as nasturtium or Indian cress. Gather the leaves of the nasturtium, be aware of any black flies that might gather underneath the leaves. Place the leaves in a container fit for a hand held blender, or place it in a strong blender together with the basil, apple, macadamia nuts and the spring onion. Add the (extra virgin) olive oil, and blend till it is smooth and beautifully green. You can adjust the thickness by added more or less olive oil. If you don’t have nasturtium growing in your garden like me, and otherwise can’t get a hold of it, you can use water cress instead. Note the nutritional facts are calculated based on water cress and not nasturtiums.